Stelios Papadopoulos, Ph.D. BioExec Institute » Stelios Papadopoulos, Ph.D.
You are here: Home / Board of Directors / Stelios Papadopoulos, Ph.D.
Dr. Stelios Papadopoulos is Chairman of the Board of Directors of Biogen, Inc., Exelixis, Inc., and Regulus Therapeutics, Inc. He is a Co-Founder of Exelixis, Inc. as well as Co-Founder and former Chairman of Anadys Pharmaceuticals, Inc. (acquired by Hoffman – La Roche in 2011) and Cellzome, Inc. (acquired by GlaxoSmithKline in 2012). 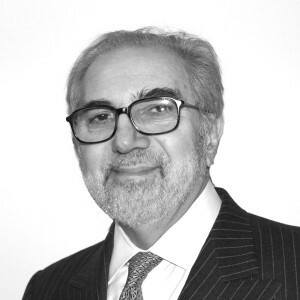 In the not-for-profit sector, Stelios is a Co-Founder and Chairman of Fondation Santé (www.fonadationsante.org), a member of the Board of Visitors olif Duke Medicine, and a member of the Global Advisory Board of the Duke Institute for Health Innovation. Stelios retired as Vice Chairman of Cowen & Co., LLC in 2006 after six years with the firm where as an investment banker he focused on the biotech and pharma sectors. Prior to joining Cowen, he spent 13 years as an investment banker at PaineWebber, Incorporated where he was most recently Chairman of PaineWebber Development Corp., a PaineWebber subsidiary focusing on biotechnology. He joined PaineWebber in 1987 from Drexel Burnham Lambert where he was an analyst in the Equity Research Department covering the biotechnology industry. Prior to Drexel, he was the biotechnology analyst of Donaldson, Lufkin & Jenrette. For his work as an equity analyst he was elected in the Institutional Investor 1987 All America Research Team. He has also received multiple honors and awards for his work in the biopharma industry as a company founder, advisor and financier. Before coming to Wall Street, Stelios was on the faculty of the Department of Cell Biology at New York University School of Medicine. He maintains his affiliation with NYU as an Adjunct Associate Professor of Cell Biology. Stelios holds an M.S. in physics, a Ph.D. in biophysics and an M.B.A in finance, all from New York University.